Flying into a hurricane might be the stuff of nightmares for the average person, but for Devon Meister ’14 MBA, it’s just another day on the job. 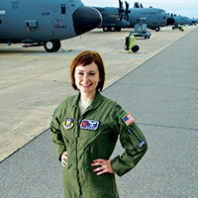 A meteorologist and pilot in the U.S. Air Force Reserves, Meister routinely flies a WC-130J into the heart of some of nature’s biggest storms, where the best data can be collected and used to help save lives. But nothing prepared her for the danger of her first hurricane mission. In March of this year, a special Congressional action signed by President Obama awarded the Congressional Gold Medal to the Women Airforce Service Pilots, the “WASPS” of World War II. Jeanne Lewellen Norbeck ’33 was awarded the medal posthumously. Jeanne graduated from Washington State College with a degree in English. President Roosevelt had funded the start of construction on the Grand Coulee Dam, and Jeanne was an early hire. 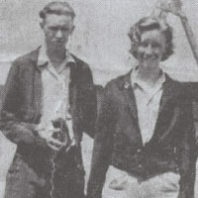 She married a young engineer on the project, Ed Norbeck.